Have an old Tesla Roadster out back with weeds growing up through the wheel wells? Has Tesla Motors got a deal for you! According to a report in the San Francisco Chronicle, Tesla Motors has begun offering Tesla Roadsters a buyback program in which their Roadster can be traded in to buy a Tesla Model S. The recycled Roadsters will later be available for purchase from Tesla Motors. Some Tesla Roadster owners weren't in it to buy a sports car, but to own an electric car. While the Roadster is an awesome car, it doesn't have a trunk, it has two seats, and in general it's not the same as a regular family Sedan. The Model S, on the other hand, seats five, is a full size sedan, with cargo areas in both the front and rear of the car, gets 265 miles per charge, and has access to free refueling at the Supercharger sites. 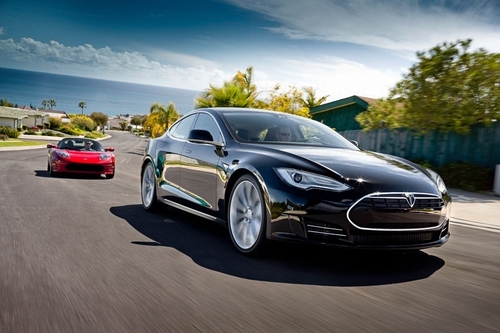 Plus, the Model S can beat the Roadster in racing conditions. The way it works is Tesla will give Roadster owners a credit towards purchase of a Model S. Because Tesla knows every inch of service that has gone into every Roadster, the company already has a good idea of the condition of the car. The actual trade-in value will depend on a detailed inspection and the age and mileage of the car. If for some reason the Roadster being traded in has more value than the Model S being purchased, the purchaser will be written a check. Roadster owners are of course free to sell their Roadster on their own, rather than trade it in to Tesla. This deal does remind us of one of the concerns traditional dealership organizations have about Tesla's sales model. In many states, dealership laws require automobile dealerships to be independent of the automobile manufacturer, and to house a service department and used car sales lot as part of the dealership. These requirements are why car dealerships typically sit on large plots of land, rather than in the middle of a shopping mall next to the Jamba Juice shop. Tesla does it differently, selling cars directly to customers, performing service in regional service centers, and until now not engaging in the business of buying and selling used cars. Oh, and placing "stores" that act more like marketing & education centers in shopping malls. How much will the recycled Roadsters go for? It'll be quite a bit less than their original sales price of $109,000. The SF Chronicle article says a 2008 Roadster with 31,000 miles would probably resell for $73,300. This means those who have been pining for a Roadster and may be able to get in on the game at a lower price point. And since Roadsters are no longer being manufactured, this could become the best way to own a Roadster in the coming years. Built, bought, and driven by the rich douchebags of the Bay Area.